The next morning is cold, wet and grey. You’d think I was still in the UK, judging by the misery that was being presented looking outside the window. But I didn’t come here for the weather. There is a city waiting to be explored! 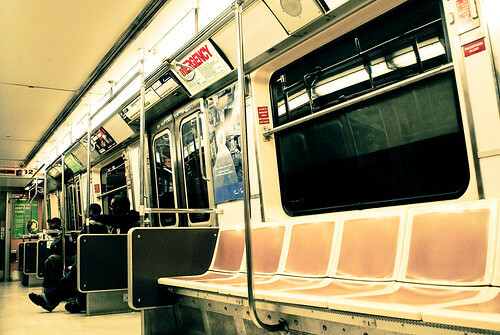 I headed towards the nearest subway station, and hopped on the next train towards the city. Though generally an organised person, my idea of initial city exploration is a jump in the deep end, immersing myself in the city with a basic map, and wandering around. And that is precisely what I did. I just started walking. It rained. I got lost. I had no sim card, hence not map on my phone. The rain mixed with the endless concrete made for a rather dull experience. I had ventured out of the ‘touristy’ area, roaming the backwaters of the financial district. Rather quiet, commuters scurrying to work trying to avoid the rain, heading towards another dreary day in the office I assume. A few passing cars. But no ‘life’. Not what I had in my memory of New York. A turn here, a corner there, that should get me back on track…let’s see where this takes me. Ground Zero. All of a sudden, there are masses of people. New Yorkers and visitors alike, they are all around. A few steps away, a giant construction site. People every which way you look. All hurrying towards wherever they are heading. Workers carrying equipment. Drilling holes. Aking noise. Building. And then it hit me. The realisation of where I was standing, just under ten years ago, the twin towers collapsed, burying thousands within. I was in Germany at the time (I’d actually just come back from the dentist), and remember watching the scenes on the television. Being awestruck, yet at the same time detached due to the physical distance between me and the events unfolding. But standing there, on a dull and miserable day, with people surrounding me, I look down the streets and let my mind wander, my imagination takes over. The fear spreading amongst the masses. The horror of witnessing quite an unbelievable event. The terror of the unknown. All taking place in my mind. Those images of thick, thick dust covering debris littered streets? Studying for my C1 licence here in London (you need a light truck licence to drive ambulances here, unlike in Australia), I realised that most North American Type III ambulances don’t have cab-mounted wind deflectors. Yet nearly all european box-type ambulances do. Additionally, they deflectors can house warning lights, heating or air conditioning units, or more space for gear. InsomniacMedic pointed out that though all regular London Ambulances have wind deflectors, the Baby Emergency Transport Service (BETS Ambulance) does not, due to weigh limitations…it was either the deflector, or the incubator. I personally believe that is the exception rather than the rule. Now to you, paramedics, purchasers and coach builders, what do you say? Goodbye London, Hello New York. From one big city to another big city. The UK was great, but I was really looking forward to NYC. The city had left some great memories from previous visits, aged of 7 and 12. Not recent, a little faded, the main recollections being the size of the place, the skyscrapers, and the general bustle of it all. With a slightly heavy heart, I board the plane at London Heathrow, hoping that I will be back soon (it was only to be just over a year until I return…). One transatlantic flight later, and the plane approaches at JFK Airport. I am a little frazzled, and I get my time zones mixed up. Did I fly back in time, or ahead? It’s light outside…is that going to stay like that for long? Was that breakfast or dinner they just served? Hopping off the plane, daylight slowly starts to slip away, and my brain clicks on to the fact that this is dusk, not dawn. I also realise I have made a fundamental mistake: I have no address, and no map. Where is my bed for the night? Being able to sleep in anything else than a damp rock shelter in central park, fighting of pigeons and serial killers, relies solely on my memory of the google maps page I glanced over a week prior. Not a great start to a big city. But it is my only hope. 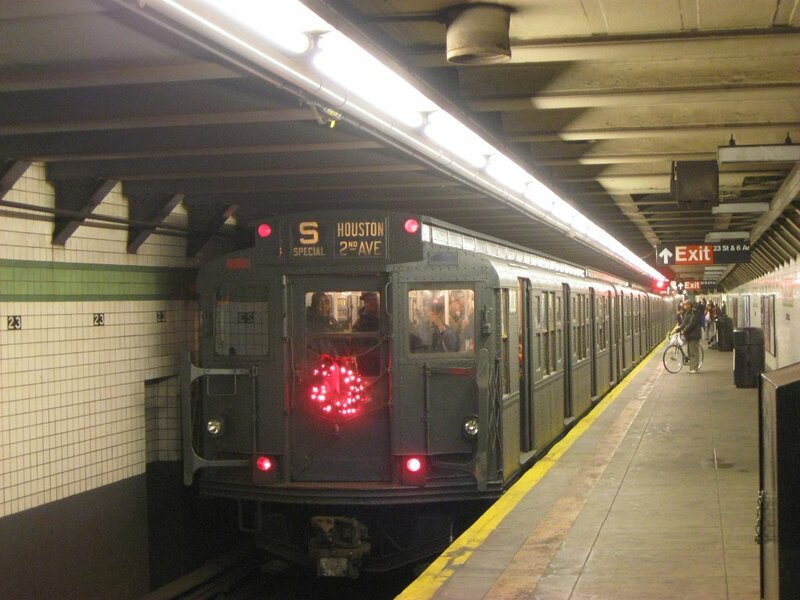 …shuddering and squealing, the dirty and worn silver NYC subway pulls in to the station. There are US flags on every carriage…yes, this is really a patriotic nation (more on that later). I board, take a seat, and soak up the atmosphere. Dull lighting, the interior tending towards scruffy, and noisy. It’s the subway, a New York City icon. And I’m on it…probably even heading in the right direction. Now, just for clarifications sake: I’m no racist. I have no problems whatever pigmentation your skin has or hasn’t got. I’m not fussed what background you have. What I must admit though, is being human, and thus unfortunately being sometimes unconsciously led astray by biased TV shows & news reports. I’d like to know the percentage of white vs. non white crimes (real and fiction) shown on TV. Sitting amongst many a person of hispanic and african background made me look around my shoulder twice initially, until I realised what a silly thing I was doing. Sure, practice safe habits in a big, unknown city, but be aware that the threat can come from anywhere, from anyone. Familiarity breeds a sense of security. Sometimes a false sense of security, but security nonetheless. In Australia, the number of people with african background is quite low, and the number of those with hispanic backgrounds tends towards zero. Familiarity breeds security, and this wasn’t familiar to me. Mind you, it didn’t help when gangsta-kid diagonally in front of me, cap pointing in a distinctively north-east direction, and his jeans crotch hanging distinctively south, pulls out a thick wad of 100$ bills, and starts counting them in front of everybody. I don’t even want to know where that money came from. Avert eyes and enjoy the landscape outside (nighttime nothingness). At least someone should hear my last scream before I die, and maybe my body shall be spared beginning its decomposition in the middle of the road. And what is that? A fata morgana? No…the Youth Hostel! I am saved! I will survive my first night in NYC! We are sent to out to standby at one of the fire stations, one of the ‘serviced’ standby points. I has an annexe for a crew on stand by: couch, recliner, tv, kitchen corner. Unfortunately, the corridor to the toilet is creepy and eerily dark, which meant I had to engage stealth mode as I crept towards the loo door, wary of any supernatural powers that may be stalking my person. A single sound would have cut my journey short, resulting in wetting myself in sheer horror, thus eliminating the actual need to go to the toilet anymore. Not a good look. Luckily nothing attacked me, and after done deed I safely returned back to the safe glow of the telly. A great thing about meeting and shadowing a blogger like Kal is that you get to know the person before meeting them. A few times when Kal started to tell me something, I was able to continue the sentence for him. At first a little creepy maybe when a person you have never met from 15000 kilometres across the globe knows a fair bit about your life, but then Kal realised he had shared those particular tidbits online at some time in the past. A call for abdominal pain comes in. My first experience with Nitrous Oxide, and I msut say, I am suitably impressed. Not intense nasal burning stench, no headaches, just a (bulky) bottle and a grateful pateint. It worked a treat. Seems a much better solution than Methoxyflurane, common in services throughout Australia (Any of you outside of Australia heard of Methoxyflurane? Yes, that stuff that is banned in the US by the FDA…). From there on, repeat performance. Crew arrives, patient is taken over, we clear. As we don’t have a particular area to cover (well, apart from the whole of Edinburgh), no part of the map is sacred. From suburbia we are sent to the heart of the city for a person lying in the streets. It’s great being driven round the central city area, preceding the shift I had been stomping around there for a couple of days and actually got to know it fairly well. The royal mile is dark, damp and desolate at two in the morning. The occasional lost soul we come across scurrys off the road to seek safety from the onslaught of the great green and yellow checkered diesel roaring monster, lashing out in to every corner of darkness with it’s cutting bright blue beacons. EMS is a great way to get to see a different side of the city on holiday. Whilst Kal navigates the some small and twisted alleyways, I contemplate my heritage – I have Scottish blood in me from four generations ago. Having it in me is one thing, little did I know that I was about to get it on me. We arrive to see a male lying in the middle of the road, bleeding from his head. Kal manoeuvres the car to block the road – the last thing we need is a car running over us! Our minds are going through the various possibilities. Assault? Hit and run? We request police assistance, and I go to stabilise his head, whilst Kal grabs a collar and some dressings. Turns out our friend had been drinking, fell over and cracked his head open…we are told that his friends abandoned him (great friends) and that he wanted to go home. All in a very merry (and inebriated) manner. A few minutes later the ambulance arrives (and the police, who are no longer needed), and via a backboard we get him on the the stretcher. Scenarios like this make me think. Where I work, all emergency responses are via double crewed paramedic ambulances, witnessing the single response concept is new to me. I ask Kal what he would have done if he had have been on his own? “Stabilised his neck until backup arrives”. One pair of hands can be seriously ineffective in some situations. Many thoughts about safety and efficacy cross my mind. This is confirmed when we are sent to our next job, where we are sent to a house that Kal has been to before, a place that left a bad taste in his mouth. A dodgy place with dodgy people…not somewhere you want to attend without police. Luckily we are stood down. We have a little spare time, and drive round to the digitals. Another cool thing about this shift is that I get to meet the people he frequently mentions in his blog. Here we are, popping by to grab something and ended up staying for a (cut short thanks to the next call) drink and chat. Later on, I meet Kal’s flatmate bambam avec cat. Our next job reveals a small town moment, when the son in law of our next patient arrives on scene, and turns out to be the owner of the paramedics favourite fish and chip shop. Proves you can never get away from people you know, there is always some degree of connection! And as if to prove a point, the next patients TV size was inversely proportional to the living circumstances. This seems to be true everywhere you go, in the western world at least. We are attending to an unpleasant person in an unpleasant house surrounded by an unpleasant family at an unpleasant hour of the morning. One of those places where you want to scrape your boots on the way out. But they have a massive TV…stay classy Edinburgh! Another Stand Down later, and the shift slowly comes to an end. We catch up on some sleep at the fire station, and I don’t need to go to the toilet until daylight scares all the monsters away. It’s time to head back to the central depot to hand the vehicle over to the day crew, and say thanks and bye to the Scottish Ambulance Service. Kal drops me off on the way home, where my weary eyes can only navigate me towards my room. At the hostel people are waking up for the day. I head to bed, with some great new experiences fresh in my mind. Kal picked me up en route to the depot, in the car with us TrickyDicky, another cheery chum of a paramedic. We chat on the way to the station about this’n’that, and I am given a quick rundown of life “on the streets” in Edinburgh, and the set up of the service in the city. Edinburgh has one central ambulance depot; all ambulances and rapid response units (RRU – pronounced ‘roo’ (do they hop? -Ed)) are dispatched from here to various standby points around the area as needed. There are different types of standby points: ‘serviced’ stand bys include toilet and kitchen facilities, usually found as annexes to fire stations, and ‘unserviced’ stand by points (a.k.a. street corner). Dispatch doesn’t like sending crews to the latter, as they can only be allocated to such a place for an hour at a time, then they must be moved – just too much work. Two 20 minute uninterruptible meal breaks are given to each crew per 12 hour shift. I am impressed by this set up! We pull up to the station. All the paramedics on duty are welcoming and some ask why I am wearing an odd uniform – some maybe not quite as curious as in London, but that may have just been chance. Having said that, I was only wearing half a uniform (plain shirt with uniform trousers). Occasionally I had to interject in conversation with a polite “excuse me, could you repeat that please (I didn’t understand a #$%&ing word)”. I love the Scottish accent, but, similar to women, I don’t always fully understand everything that is said. Kal sorts out his stuff, and we head to our assigned RRU. He checks his drugs, shows me through the bags and I poke my nose around the car. Interestingly, all the vehicles in Edinburgh have manual transmissions. Different (I’m used to autos everywhere in Australia), but everybody seems to like it that way. I would find it awkward to have to balance emergency driving, shifting and speaking on the radio simultaneously, plus I don’t see the upsides of a manual transmission (apart from cost savings); more work and less smooth. From a stretcher point of view, the vans either have ramps, the newer ones tail lifts like in London – great for manual handling and having a long lasting career (and back)! The last few pockets of equipment are checked, and right on time we receive our first job, a gentleman in respiratory distress. We race off, and I am impressed by the siren switch: double honk of the horn activates the siren, a single honk changes from wail to yelp, and another double honk turns it off again. Simple yet brilliant (a.k.a. what I want in my dream ambulance). We arrive on scene, and while grabbing the gear, Kal turns to me and stats “I shall now adapt to the environment”. Silently hoping that he can, by magic, change his bright green uniform to a dull grey house facade colour in true chameleon-style, I realise what he means five seconds later when he comes out with a Class-A Scottish accent. As if he had lived in Edinburgh since the day Arthurs Seat [LINK] was plopped down by the god of rocks. You see, Kal isn’t from the ‘burgh, and therefore doesn’t normally speak with a Scottish accent. To blend in, and be accepted with the Scottish crowd, he fakes it. The locals feel more at ease with a familiar accent. Reassurance – even if it means speaking funny – is key – it’s all part of patient care! On scene, vitals signs are checked and treatment is commenced. I can’t help myself but to fall back in to ‘driver mode’, and ask for patient details and medications (sans faux accent). Kal seems to be happy to have an additional pair of hands with him tonight. I’m more than happy to help. The ambulance arrives, and I am thrown a quizzical look by the paramedics. After an explanation, they nod to acknowledge the information offered, but an air of bewilderment stays. It’s not everyday that an Australian on holiday turns up observing! We retreat to the car, and Kal types up a few notes, and we are clear for the next job. Every vehicle has a tablet for electronic patient care documentation. For the RRU, short ones are written up, then added to the transporting crews documentation. I ask about the personal side of the service, how everyone gets along. He states its like a big family; not only does everybody know each other in the Edinburgh region area (approximately 140 staff), Kal says he’s been out with them all, had a beer and met the family. Another beep, and we are sent off somewhere, but cancelled nearly immediately – memories of the recent shift in London are awakened (where half the calls sent to us were stood down). But more work is just around the corner. We are sent to a female with chest pains, top floor of a large apartment block. The norm in most of Europe, in low density suburban Perth it is a bit of a novelty when we go in to a block with more than ten parties. It turns out that our patient is probably suffering from anxiety attacks again, her husband is able to translate most of the questions, but not everything adds up. We have a few minutes to spare until the cheery crew pulls up with a chair to take the patient to hospital (and an interpreter). Don’t miss part II, full of blood, huffs and creeps! I was recently interviewed by Matthew Harris for his HarrisCPD podcast. We discussed what it is like as a paramedic in Australia, the australian paramedic education system, how to become a paramedic here and the up and coming paramedic registration. Click here to get to the podcast page and listen to it. I recently came across a tweet from a nurse telling everyone about international nurses day – here is some information on wikipedia. Why don’t we have such a day? When is “International Paramedic Day” ? Nursing has been around for a long while, and has undoubtedly done a great deal for society. Whilst Paramedicine is not as old, we still contribute greatly to society (at varying levels of respect and trust; compare some parts of the US with Australia). Our position and responsibility in healthcare will only grow as healthcare and paramedicine learns to adapt to new challenges (ageing population, recognition of early intervention, staffing shortages, cost-benefit calculations). Look up the article on International Observances on wikipedia. Not only nurses get their day, but there are also days for the sick, health, ear and hearing, physical therapy…the list goes on. There are localised efforts to represent paramedics in the community (e.g. National EMS Week in the US, Thank a Paramedic Day in New South Wales, Australia), but nothing international. Plan for action: The web is a great way for international communication and exchange. International Paramedic is a great platform for just that, it has some great and influential members, contributors and thinkers from around the world. We all know how underrepresented our profession is at times, how uneducated not only the public, but other professions can be towards our education and interventions. Time for an international push in the right direction! Set a date: Nurses day was initially Florence Nightingales birthday. An appropriate date needs to be identified, ideally having something to do with someone who had great influence on EMS (along the likes of Dominique Jean Larrey perhaps?). Set a timeframe. A day, a week, a month? Anually, Biannualy? Options to be explored. Set an agenda: What International Paramedic Day should represent. Get in touch with the WHO and UN – they already officially endorse a couple of other health related days. Get in touch with various Paramedic Services around the world to implement such a day.